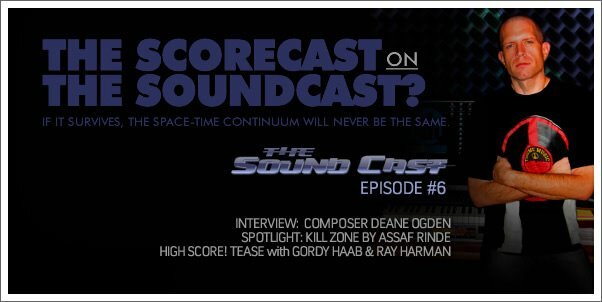 Interview with composer DEANE OGDEN (The Way Home), SoundCast Spotlight: ASSAF RINDE; GORDY HAAB and RAY HARMEN (Indiana Jones/ Staff of Kings) Interview preview. 08:24 - Pimping High Score! 03:28: Red Cliff: "The Beginning"
12:34: Indiana Jones and the Staff of Kings: "Run for Your Life"
13:52: Indiana Jones and the Staff of Kings: "Turkish Puzzle"
15:10: Indiana Jones and the Staff of Kings: "German Boss"
08:13: Lost World Returns: "Spitfire Gameplay"
19:53: Dreams on Spec "Suite of Dreams"
25:24: The Way Home: "Theme"